O/n at 3star hotel Lhasa. Sightseeing and rest day for acclimatization at Lhasa. After breakfast, drive to shigatse. The journey today brings you over two high passes with fine views. For lunch we stop in the small town of Lhatse. On the first long driving day over the sandy and rocky land of Tibet, other things like lake, nomads chasing thousands of yaks and sheep keep you busy. Overnight at saga. 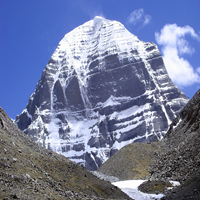 Today is the day for the lifetime that you are going to have Darshan of the Holy “Mt. 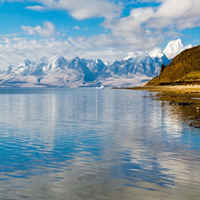 Kailash & Lake Manasarover”. Day's program as usual, after breakfast at around 7 am - we drive through Mayum la pass (17000ft). Puja/holy dip at the lake followed by Manasarovar parikrama in bus. Time permits visit Chiu gompa. Drive to Darchen (4600m). Day 10: Darchen/Sershung/Dirapuk (4765m, 18km). 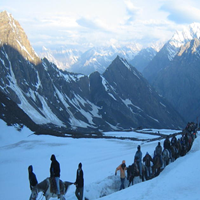 This is the day every pilgrims talk about, the most difficult journey throughout the yatra. The last pull to the pass is steep and, due to the altitude, unrelenting. At a dizzy height of 5640m (18600ft), theDrolma (Tara) La marks the transition from this life to a new one. 200 m-below the pass is a view of the lake of compassion, Gauri Kund (5440m/18400ft). The path stretches ahead, with distant mountains on the horizon. The way down is long and the last descend is quite steep. Further trek on the east bank of the river and reach Zuthulpuk , dinner & overnight at Camp (tent/mud-house ). The walk between Dirapuk to Zuthulpuk may take about 10 to 12 hours. After breakfast we trek around 8 km, and we will reach to the place called Zhong Chu where the vehicle will be waiting for us - drive to Darchen, and after launch drive back to Saga. Drive back to shigatse. Overnight at hotel. Early morning, drive back to Lhasa, O/n at hotel in Lhasa. Early morning drive to Lhasa airport and take the flight back to Kathmandu.